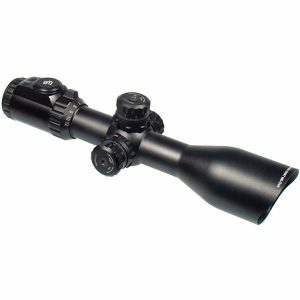 The UTG 30mm SWAT is a highly popular Leapers riflescope, used by hunters for its top grade design and convenient features. 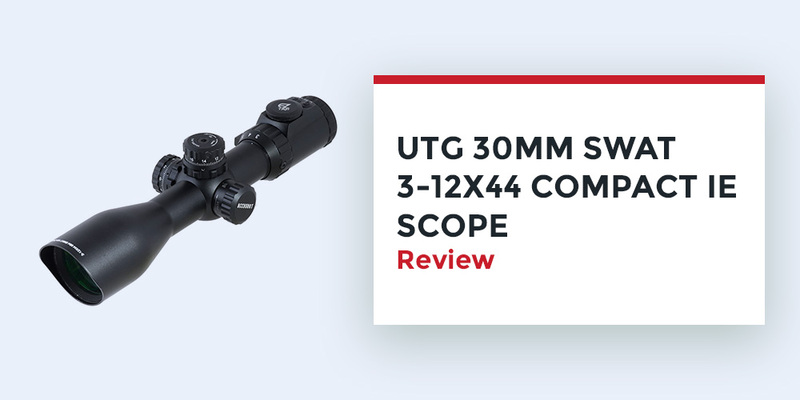 The UTG riflescope boasts of advanced technology and innovative features, and is built on the True Strength Platform which guarantees years of reliable use. This genuine scope is the perfect companion for your game hunting activities, and will ensure that you have a one of a kind experience with no chance of trouble. This scope use for a variety of shooting situations, check out the SWAT scope review below. The UTG 30mm SWAT scope is composed of a wide range of illumination options, making it perfect for tackling different weather and terrain conditions. The patented IE technology found on this scope is integrated into the reticle, and it provides the standard dual colors of red and green, in addition to an astonishing 36-color mode. This astounding illumination technology is great for color blind shooters, as it allows them to find the perfect color match for their eyesight. There is also a control console that allows for personalized and intuitive color managing. This IE technology provides uninterrupted illumination even when faced with heavy recoil. Another great feature of this UTG SWAT scope is its well-built Zero resetting target turret and Zero Locking function, which allow for precise and detailed windage and elevation adjustments in order to enhance aim. The scope is also composed of a conveniently located SWAT (Side Wheel Adjustable Turret), which has an intuitive design for easy adjustments. You can now make parallax adjustments that exceed the usual 10 yards. The UTG SWAT has a mil-dot reticle, which is valuable to all hunters and shooters. This Tactical Range Estimating (TRE) mil-dot reticle enhances performance and accuracy levels, and allows for scope versatility whether you are shooting at short range or long range targets. The Reticle also has nine dots on every cross hair direction, which is much more than the standard 4 dots. The UTG SWAT is also made up of multi-emerald lenses, which allow for maximum light transmission so that your view is crystal clear. The inbuilt 30mm tube also has the best lens coating, for crisp images as you hunt or shoot. There is also an angled integral sunshade and flip-open lens caps, which work to direct the light that is coming through the scope. When it comes to uninterrupted illumination, the UTG SWAT scope has a unique circuit and housing design that promotes this intuitive operation. This design guarantees uninterrupted illumination even when you are facing heavy recoil from your weapon. Equally impressive is the 3-12x magnification, which allows for short and long range hunting alike. This magnification power promotes versatility, so that you can hit far away targets and then accurately adjust your scope so that you can hit targets in close quarters. Q: What is the purpose of the Smart Spherical Structure (SSS) on the scope? A: The SSS works to strengthen and simplify interaction between the inner and outer tube, in order to achieve responsive and accurate windage and elevation adjustment, as well as recoil resistance. Q: Does the UTG SWAT come with mounting hardware? A: Yes. This scope comes with heavy duty weaver style rings, which can be used for mounting. Q: Does the SWAT scope need a battery to get a cross hair? A: The cross hair is black and therefore requires no battery. The battery is only used to illuminate the reticles. The UTG SWAT is definitely the best scope accessory for your air gun. 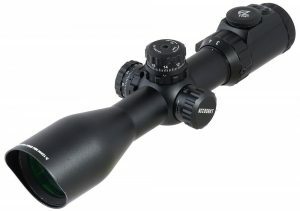 This riflescope works to provide consistent performance, as well as high accuracy in any and all conditions. The precise adjustments on the scope guarantee reliability for a long time to come, even after facing punishing recoil from your rifle. 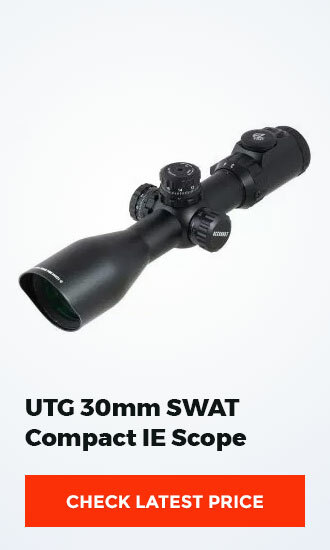 So when you take the features and functions of the UTG SWAT into account, this scope definitely takes the spot as the highest quality scope within your budget. What more can you ask for?